I’m a Photographer, Not a Terrorist! I’m a Photographer, Not a Terrorist! 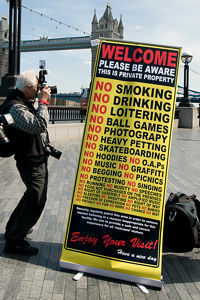 (PHNAT), the campaign group set up to fight unnecessary and draconian restrictions against individuals taking photographs in public spaces, organised a flashmob outside London’s City Hall today. Not a lot of people turned up (maybe between 70 and 100) but a letter was handed in to Boris Johnson. What many people don’t know is that the land along the embankment between Tower Bridge and HMS Belfast is privately managed, and the company that runs it has draconian restrictions on what can and can’t take place there. This is also true of many other places in London – Canary Wharf and Broadgate have similar restrictions. Try taking photographs with a professional looking SLR and see how long it is before you get stopped by one of their security guards. You score extra points if they start talking about ‘the terrorist threat’. There are a few more photos of the event at Flickr.